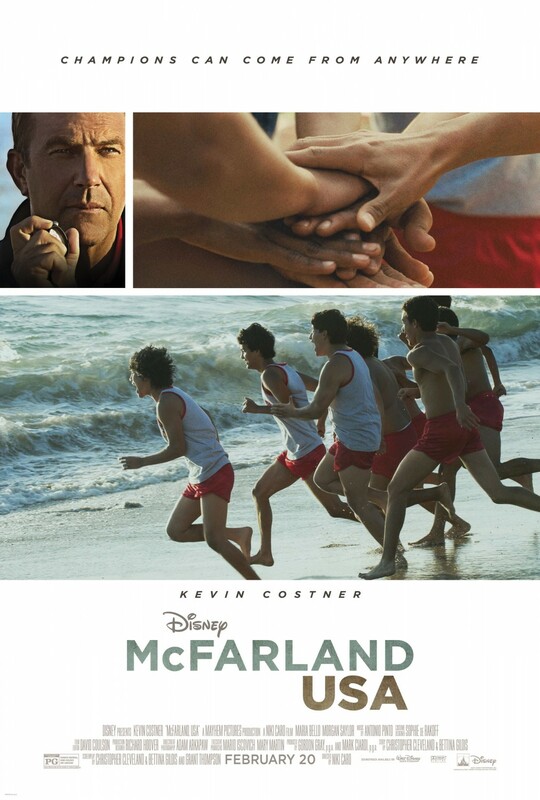 Many movies follow a proven formula very closely, but sometimes a well written, well executed formulaic movie can remind you how appealing that formula can be, and that is McFarland USA, an inspirational Disney sports film that warmed my heart. Kevin Costner stars as a science teacher and sports coach for a working class California town mostly populated with Mexican-American immigrant families. He sees the endurance and speed of several students and decides to form a cross-country team, even though he’s never coached anything related to track in his life. What follows is a mixture of the inspirational teacher film and the inspirational sports team film. Thankfully the screenplay and director Niki Caro (Whale Rider) take their time to flesh out the runners, giving them personalities and different degrees of depth, troubled by real-world problems without easy answers. The movie works as a great tool for empathy as it respectfully illuminates the limited economic opportunities and backbreaking labor of so many Mexican-American immigrants toiling in our fields. The movie creates an amiable sense of community and even though moments can feel contrived, I always had a smile on my face. The people came across as people, complicated, proud, hopeful. It opens up a world and showcases just how hard these people work to assist their families. Costner is a stable anchor for the film but it’s his young cast that really give the film its lift. The emotions are genuine and the uplift is earned, thanks to careful plotting and generous characterization. McFarland USA is a feel-good movie that’s better than good and a perfect film for the whole family. Posted on February 26, 2015, in 2015 Movies and tagged disney, drama, kevin costner, niki caro, sports, true-life. Bookmark the permalink. 1 Comment. Good review Nate. It’s everything you expect it to be, except, with a dash bit more heart and hope thrown into the proceedings to make it feel more meaningful.